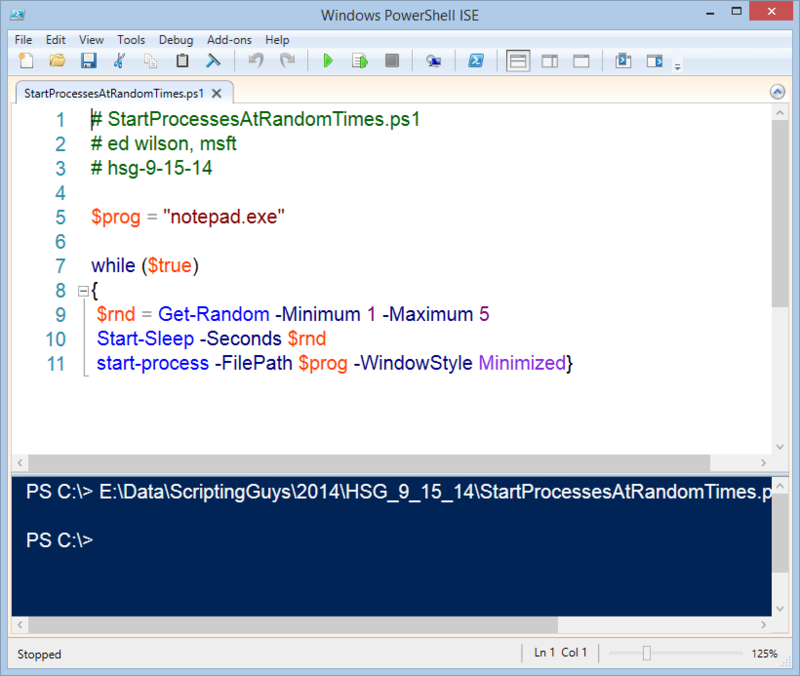 Summary: Microsoft Scripting Guy, Ed Wilson, talks about using Windows PowerShell to start a process at random intervals. Hey, Scripting Guy! I have a rather unusual request. I am testing a new monitoring application, and I need a script that will start processes at random intervals so I can check the effectiveness of the solution. Is this something you can help me with? Microsoft Scripting Guy, Ed Wilson, is here. This morning I am sitting on the porch, sipping a nice cup of green tea with orange flavorings in it. The tea is called Orange Cream, and it tastes exactly like the old Dreamsicles I used to eat when I was a kid. It is a different way to start the morning. I am cooling off after spending an hour in the gym. I have my Surface Pro 3 that the Scripting Wife got for me for my birthday (it was an early birthday present…I have had it for awhile now), and I am catching up with email sent to scripter@microsoft.com and Facebook. I don’t know about you, but lately, it seems like I am always multitasking. I find it hard to sit and do just one thing at a time anymore. I’m not sure if this is a good thing or a bad thing. Get-Random To generate random numbers. I also know that I will need to specify minimum and maximum values. I will accept the default seed. Start-Process To start the processes and give me a bit of control over the way they start. For testing purposes, I probably want to use a minimized window style so that it does not block other things (such as the Windows PowerShell ISE for example), and so I will still be able to see that the processes have in fact started. Obviously, I will need a way to specify the program name (and path if needed). I can do this with a variable. Start-Sleep To control the amount of time between the startup of the process. I will use the –seconds parameter and use the number I get back from Get-Random to control the sleeping. This also means that I will need to use numbers large enough to be minutes instead of seconds (for example, 300 for five minutes). While statement To put the script in an infinite loop. I am only testing the script at this point, so this will work well because I am sitting here monitoring it. Later I may want to increase my minimum and maximum random values, and run the script over a twelve hour period of time. For this, I will use the For statement and control exactly how many times I want the script to execute. Note Using While ($true) puts the script into an infinite loop. To stop the loop, press the red square (stop button) in the Windows PowerShell ISE. The problem is that it does not sort properly. It looks like it is sorted, but I try the ascending and the descending sorts, and I see the order does not change. Dude. 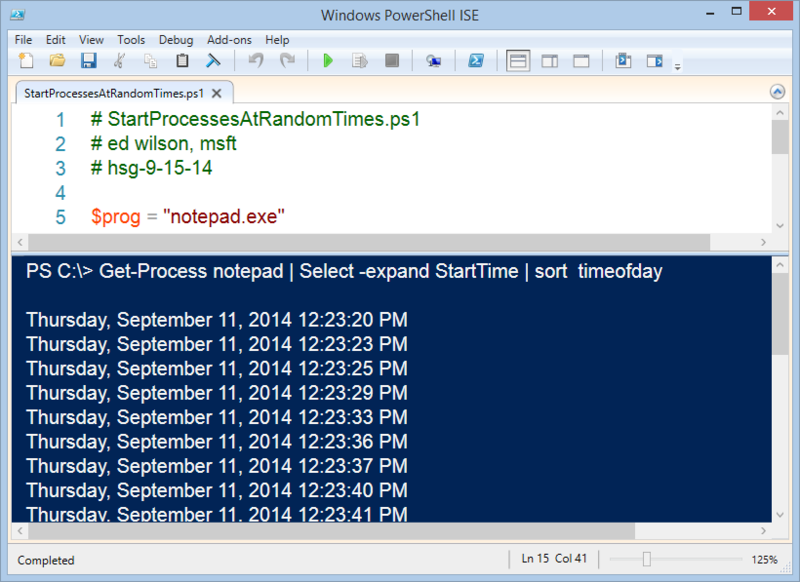 BB, that is all there is to using Windows PowerShell to create processes at random intervals. Process Week will continue tomorrow when I will talk about launching random processes at random times.